Rapid CSS editor is an HTML and CSS code editor designed to make you more productive. With Rapid CSS you can create modern HTML and CSS-based websites and user interfaces faster and easier. 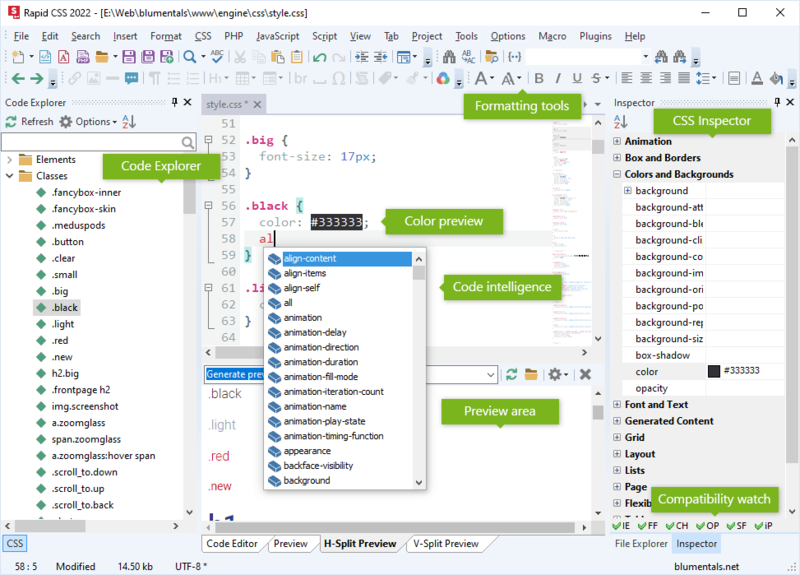 Coding is a breeze thanks to many intelligent features such as auto complete, code inspector, CSS checker and instant built-in multi-browser preview. What's new in 2018? Rapid CSS combines speed of a simple text editor with the power of a full-size development suites allowing you to work faster and smarter. Be up to date with the latest HTML5 and CSS3 specs and development trends. Easily create fluid CSS layouts and mobile websites. Just check the feature list and screenshots for what you get and then try it out. You will be surprised! Rapid CSS editor offers you the best features-to-price ratio. Guaranteed! How is Rapid CSS better? Unlike with other HTML and CSS editors, Rapid CSS loads instantly. Rapid CSS code editor features are carefully crafted with speed and productivity in mind. Rapid CSS editor is quick, clean and lightweight. It very powerful, yet not stuffed with useless buttons or panels. Syntax checkers, validators, debuggers, beautifiers, built-in CSS prefixer etc. Rapid CSS is a perfect HTML and CSS editor for learners. Thanks to its unique combination of simplicity and powerful features, Rapid CSS editor is used by many schools, universities and web development courses. Rapid CSS is the obvious style sheet editor choice for expert web designers, because it packs unique punch of features, speed, flexibility and value in a single HTML5 and CSS3 editor. You may also want to look into our more advanced editors.